A poster advertising the February “All American” concert for the Carnegie Mellon Wind Ensemble. 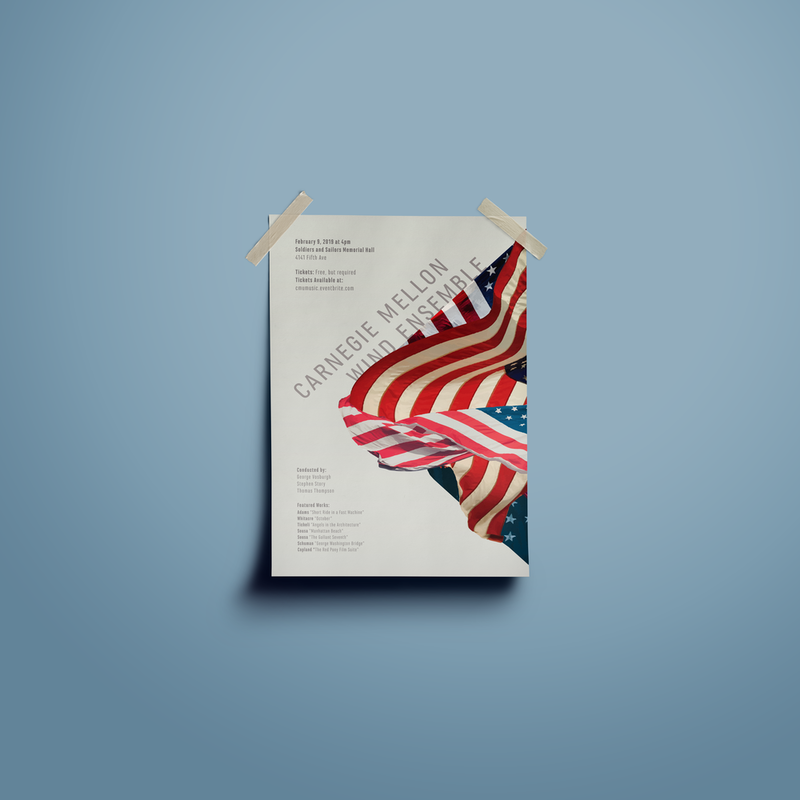 With this poster I tried to take the most American symbol I could think of, and use it in an unconventional manner while keeping a neutral/serious tone like the featured pieces of the concert. After removing the backgrounds of several Unsplash flag images, I began to play with layering and was drawn to applying a mask to create a more graphic image. While I liked the graphic-ness of the diamond shape, I felt as though the graphic wasn’t prominent enough and was too restrictive, so I opted for a version where the scale increased and the position shifted off-center. After a request from the Wind Ensemble directors, I changed the flags from gray tones to color and warmed up the background color to fade into the white hue of the top flag layer. From the 3rd iteration to this one, I sought out the critique of my design colleagues who recommended a more organic shape for the flags. I adjusted the collage of the flags to highlight the natural wave and soften the form.